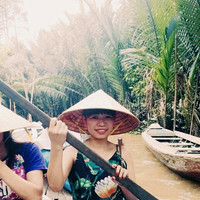 Hi travel lovers, I am Belle from Vietnam. Now, I am living in Hanoi city but I was born and raised in a small village. If you ask me what first come to mind when I think about my village, I would say “rice”. And come with rice is the unique local culture which varies in each region in all Vienam, Laos, Cambodia or Thailand. I have endless love for nature, landscape & culinary of not Vietnam but all Southeast Asia, and a great passion to stroll around the regions every year, from breathtaking mountains, lush green valleys, mighty Central Highland to spirit Mekong Delta, stunning sandy beach etc...The strong connection of people’s soul with the place where they were born & their ancestry make cultural diversity and unique customs. Here, tradition & ancient does not vanish, it lives in modern. I promise a trip which you will have chance to experience, feel & love our regions. This review is for Huyen. Working with Huyen to organise our trip was wonderful, she understood exactly what we wanted. Everything worked like clockwork, pickups, itinerary, our 3 guides were amazing and so keen to tell us about the history of Vietnam. Our vehicles were great and drivers amazing. We appreciated cold water our guides gave us each day. They took such good care of us. We enjoyed having some free days, also being able to take extra free time when needed. Highlights of our trip were: Street Food in Hanoi, Beautiful boat on Halong Bay (2 day 1 night) this is a must and Jimmy and his crew on V'Spirit was fantastic, Market and Cooking Class in Hue was fantastic! Cyclo Tour in Hue lots of fun and we saw so much of the town, evening on boat with folk songs and music, Farming & Fishing Tour Hoi An where Toni fed Water Buffalo Leisure day at An Bang Beach Hoi An relaxing at a Beach Club beautiful clean beach Boat on Mekong Being able to email Huyen as many times as needed (and I did lots), was a great way to plan the trip you want. Huyen was so quick to reply and always happy to make changes. All the paperwork, organising of visas, the internal flights etc. was very easy as Huyen knew exactly what was needed. My Vietnam trip started in Hanoi with a overnight sleeper bus to Ha Giang. Huyen was correct when she advised that I take the 22 passenger bus with private compartments. Ly who is Huyen's colleague proved to be an invaluable contact. We used Whatsapp. The sleeper bus was over an hour late leaving for Ha Giang and a text to Ly told me that they bus is on the way. When Ly found out my was on the night I returned to Hanoi from Ha Long Bay she dropped off a present. Much appreciated. The service provided by both Huyen and Ly was excellent. I travel 4-5 times a year and the ability to contact them and get a response in a timely manner was great. Best service I have gotten in my travels. Huyen was amazing, not only when we were planning our trip, but also while we were traveling in Vietnam and Cambodia. She helped us plan an unforgettable trip and was in touch with us almost daily, and made sure we were happy with our guides and accommodation. She is personable, kind, helpful and accessible, we highly recommend her! Huyen was available to answer questions. We never got left out. All pickups worked out. Very fast in replying my questions and getting things confirmed. All hotels, excursions and transfers were available and on time. One flight accidentaly booked on the wrong day was corrected without fail. Huyen was very responsive to every communication, she followed up promptly and was polite and had excellent English. She was available to answer questions and actually came to our hotel and left us a gift. Very nice. Huyen in particular and later Ms. Ly were just fantastic. Both were highly professional, extremely easy to deal with and highly responsible. The trip was extremely well organized with every step working with almost military precision. I spent a month traveling through Vietnam and the trip was set up almost exclusively (I booked one say in Saigon) by Huyen and co. They arranged hotels, excursions, pick ups, flights and even an overnight train ride. I visited. Saigon, Hoi An, Hue, Hanoi, Halong Bay, Sapa and Phu Quoc, eventually returning to Saigon. Huyen did an excellent job in setting up a fantastic trip. Her attention to detail was impecable and communication was perfect. We were very happy with the process and feel she listened to what we wanted to experience The adjustments to the itinerary were well done and we had a blast. A wonderful experience. Huyen planned an incredible 2-week trip for us to Vietnam and Cambodia. We ended up with an itinerary that got us to all the sites we wanted to see and offered us a great variety of activities: biking in Mai Chau valley, a cooking class in Hoi An, the most amazing cruise around Lan Ha Bay, the historical and cultural sites of Hanoi, hiking through the temples of Angkor Wat. Our guides and drivers were all excellent & the support from Huyen and her colleagues meant that we felt that we were in good hands the entire time. The service we received really was exceptional. Huyen has been really supportive and she chose good quality hotels and places to see. Guides were very good too. Two suggestions: 1. Chinese market in Ho Ci Min City was of little interest: perhaps it could be more interesting a longer visit to War Museum, or a walk from Cathedral to Bitexco Tower, or something like this; 2. in Ha long Bay, we were expected to visit Bai Tu Long, but we visit instead the "traditional" Ha Long, that was very crowdy, Please check with Lavender Cruises the right cruise they plan. As for all the rest of the trip, it was worth to go: we recommand Mai Chau and a visit to My Son. Perhaps two weeks were a short time, but we had an idea of a rapidly developing country and of friendly people. Very nicely done and great attitude (and results too) while assisting us to deal with surprises for the trip. The trip was fantastic. After I explained my desires to Huyen, within days she planned a great 12 day trip in Vietnam. Her suggestions were excellent. Every transfer was accomplished without any problems. The tour guides were knowledgeable and spoke English very well. The only negative was our understanding of a Vietnamese 3 star lodging, the hotel websites always make a place look better than they actually are. However, we upgraded after arrival to 5 stars and everything was good. Also, our in country contact was Ly and it was helpful to be able to communicate with her via WhatsApp. Plus, we enjoyed meeting her in Hanoi and appreciate her gift. Huyen did a fantastic job arranging an itinerary that suited us. She was always happy to amend and revise and make plans that worked really well. All of her suggestions were spot on and no one could have done a better job. I was impressed with the service she offered. Huyen did a great job putting the trip together and assisting us with the planning. The package had a nice variety of places to see and things to experience. Some of the guides were better than others in terms of attitude and leading us. One improvement that is needed is none of the drivers could speak English. In particular at the airport being picked up, it was difficult to know what was going on or asking questions about where we were going, how far to the hotel and history of the area while driving. That particular driver was also sick and kept sneezing and coughing. I think I caught his cold because I became ill for 6 days. Other than that we loved the trip. The choice of hotels was very good! Huyen was helpful and very organised. Every detail was taken care of. Wonderful! great, I got more than what was promised. We were 3 families booking via Trip.me - a total of 14 people (6 adults and 8 teenagers) on holiday to Vietnam for 11 nights. So a substantial payment (in advance) to a company we did not know. And everything worked perfectly, the payment was simple and secure, and the service delivered was fantastic : an excellent itinerary was worked on together and booked (with transport, hotels and excursions) and visa’s were obtained - all by Huyen of TripMe. I would not hesitate to recommend Huyen and this company to anyone. Thank you to Huyen for organsing a great 11 day trip for us and 2 other families. We had an amazing time and all was very well organised. We were met at all airports on time, decent transport when on the road and the guides were all very knowledgeable. i would do 2 nights Hanoi which is a much nicer city that Saigon (Ho Chi Minh City) but from Saigon you see the Cu Chi Tunnels which are a must see. Huyen did us proud with a great trip and we really enjoyed ourselves from start to finish. I think they are a great company to work with! Thank you! This was our second trip booked through trip.me and we couldn’t be happier! Everything from the planning to the execution was flawless and Huyen ensured our 100% satisfaction. Ly was our contact throughout the trip and she checked in with us every day, keeping us on schedule and providing guidance and advice. The planned activities were spectacular for giving us a flavor of Cambodia and Vietnam and allowed us to see all of the major sights; it balanced nicely with our free time. On our own, we booked a couple of tours with Vespa Adventures, which I highly recommend! Thank you to the trip.me team for a memorable experience! Very well organised and constantly kept in touch with me throughout the trip to make sure there were no problems. Fantastic work by Huyen with regards to the in-depth knowledge of the place and great service with regards to accommodating our every request. 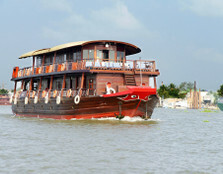 Comprehensive travel to Vietnam. 17 nights. Very well planned and organized. Very good support before we made payment for the tour and very average after. No checking on client wellbeing until being reminded about it, no personal touch expected for private tours (some of the activities were booked at very bad timing, wasted time at airports instead of checking online, etc.). Excellent guide selection in all places. Overall good experience. ​​1. Immediate response: Sometimes I cannot reply to your message or do each of your requests immediately (such as change the pick-up time, check-in, etc.) because we need time to contact the people in charge (driver, tour guide, etc.) before I can get back to you. However, we will improve and try to be faster for next time. 2. Bad timing: My first offer with the Ha Long bay cruise to you was an Aphrodite cruise which would have taken approx. 4 hours driving from Hanoi. However, it was sold out and I had to book for you the Eracruise with the route: Lan Ha Bay. It takes only 2 hours driving from Hanoi to the port of this route. But all transfer/flights had been of course arranged (and stayed the same) from the first route, which had led to your additional waiting time in the port and airport. I am so sorry for this inconvenience. 3. Error checking-in online: When I tried to check-in online for you, I had received a notification from the airline (which I sent you) about passengers having errors checking in, and they recommended to check-in the counter or kiosk machine at the airport. However later on, the problem was fixed and you could then check-in by yourself. It was my mistake that I did not check the website again and that I did not know it was fixed, and I apologize for that. I feel really upset because the trip could not be perfect due to these inconveniences and again, I am so sorry about it. I really appreciate your feedback and it will help us to improve our services. I hope we could have another chance to serve you in your next trip to give you our better services! Huyen provided a perfect experience for our first trip to Vietnam, Cambodia, and Thailand. She was always available for questions and each tour was perfectly planned!! My husband and I had a memorable trip to Vietnam, Cambodia and Laos. Huyen and her colleagues handled all details including internal flights, accommodation, and wonderful guides and drivers. Huyen provided 24 hour support, which we didn't need, and all the contact information for our guides which was helpful in arranging details within in each country. We were well taken care of and had no worries throughout all three countries. We particularly enjoyed the beauty of northern Laos. We highly recommend Huyen. Very professional and an excellent planer from start to the end of our trip, with an amazing crew helping her. Deeply thankfull to Huyen and her team from our first encounter up until the end of our trip. Highly professional. The 24 hr contact was invaluable. The arrangements were seamless - from airport pickups to hotel arrangements. Everything was in place. I just wish I had had an opportunity to make some different selection in terms of class of service. For example, I would have preferred to take a train to Sapa rather than a sleeper bus. Also would have upgraded other options. Huyen is an amazing agent she was patient professional and friendly. She fullfiled all my demands and the services the choice of hotels and the punctuality of the drivers just exceeded my expectations. A special thank also to her colleague Hien who was so helpful and welcoming. We thoroughly enjoyed our holiday and would like to thank you so much for creating our AMAZING holiday in Vietnam!! We’ve had the best, worry free holiday we could have hoped for. Thank you again Huyen for all your prompt communication and your quick action when we weren’t feeling comfortable. Vietnam is such a beautiful place and we’ve met some beautiful people along the way. Staff have been so welcoming and always helpful. What a lovely way to end our holiday here at Phu Quoc, it’s been so relaxing and is such a stunning location. Overall, staff, guides and drivers were all very friendly and professional and did all they could to ensure we had the best holiday. Accommodation was excellent too. Our favorite hotel was the Eldora in Hue. So luxurious! It’s too hard to say what our favorite place was but if I really had to choose it would b Hanoi. Thanks Hien! I cannot recommend the services of Huyen highly enough. From start to finish she was extremely professional and helpful. We had a long list of demands and specifications and these were all met throughout our stay in Vietnam. We plan to return to a different part of Vietnam in the not too distant future and will not hesitate to contact Huyen again. We, my husband and me, visited Cambodia in May’2017 with Huyen. It was a grand experience for us. She arranged a perfect customized holiday for us. From airport to airport, all the way we were guided very efficiently with a comfortable car with efficient driver and well informed guide. We stayed at Siem Reap just for 4 nights and we completed all the popular tourist places. 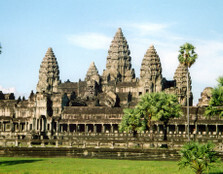 We have special interest on temples so, they completed almost all the temples around Siem Reap. Our guide was really good on his job. Enough knowledgeable about history and culture of Cambodia. Apart from the pre-fixed schedule he suggested a few things to do and we enjoyed all the things. I want to thank him especially for bringing us to some really good restaurants, till date I remember the tests of the foods. We are fully satisfied of the service. Highly recommended. Huyen was very professional and very much easy to communicate with. she was quick at responses. was helpful always and patiently explained how things works. gave me full assurance and courage that things will go well. My experience was fabulous. All arrangements went very well. The hosts on the ground were very knowledgeable with the place in Hanoi, Ho Chi Minh city and Siem Reap. The good thing was they met us at the airports. - make sure the qualities of the hotels are consistently to the same standard. Siem Reap hotel was not as good as the hotels in Vietnam. - make sure you spell out what is included in the price clearly. eg, in Ho Chi Minh city lunches and dinners were covered by the agent but not in Siem Reap. - I think the price was too high for the experience and the hotel qualities. - Overall though, I will certainly make use of her services in the future. Everything was perfect. Very well organized. The guides were very friendly and helpful. They all were always on time. Something that I liked a lot was the opportunity to change the program if we were tired or there was some other reason.We enjoyed our trip a lot and we will recommend you to our friends. Huyen couldn't have been more helpful and thorough when planning and setting up the trip, answering every query we had and covering all areas we wished to visit. Unfortunately she handed over the trip to another agent who used yet another agent to complete a portion of the trip which was totally unsatisfactory. Initially we contacted the representative for the 2nd agent for that section but not being satisfied contacted Huyen and she dealt with the problem immediately but then SAT BACK and we were left to deal with the representative of that second agent which involved a lot of wasted time and annoyance. As we booked through Huyen it was HER JOB to deal with and get the resolution resolved without us having to deal with the 2nd agent. We will never deal with Nachi Holidays nor recommend them to anybody as they had obviously not checked out the 3rd agent and yet had used his services for many years, so we were told. The 3rd agent, a Mr Tan of Vietnam Nomad trails in Sapa Vietnam, we personally found to be an unscrupulous person who shows no respect for customer or Hmong members who he uses to further his company whilst underpaying them for their services. I would strongly advise connecting with the Hmong people direct and enjoying their hospitality and genuine warmth without fear of a percentage of your money never reaching them although their services are wonderful. In conclusion I thought the set up by Huyen was excellent but given that every agent got a commission from us she needs to be more vigilant in her use of agents and who they pass the buck onto. This may seem small bikkies but when some one has spent over $1000 on airfares to experience what could not be delivered it leaves a very sore taste in the mouth of the aggrieved traveller who will never recommend Trip Me, Nachi Travels or Vietnam Nomad Trails to any one. I personally was going to use Trip Me for a month's trip in Peru in the future but now have grave reservations about doing such a thing and will seriously look elsewhere. Dear Ruth, firstly, I would sincerely like to apologize for all that's happened and I really understand that these things should not have happened in your Sapa trip. I am really keen to try my best to make it up for you if I have the chance to assist you another time. I truly promise to arrange for you a nice trip without hiccups for the next time. Regarding the agents and agent Tan also, I have well noted this and I will never use the agent's services again. I'm really upset about this too and it is a great lesson for me to learn for the future. Once again, I truly apologize for this experience and I really appreciate you letting me know these details. Huyen was very prompt in her replies to my emails and offered a choice of suitable alternatives, if her first suggestion was too expensive or not what we required. Hi Huyen, Our trip was fantastic and everything went like clockwork. You put together a very very professional package, and most of all a schedule of the guides including their names and telephone contact who were meeting us at each destination. We applied for our visas on line for collection at point of entry in each country and all went very smoothly with no long queues as we had anticipated. The guides and drivers were very good; Ms. Trang in Hanoi was particularly outstanding doing everything possible to ensure we enjoyed our stay, we were not rushed and they were all happy to take photos of us at various points. Thanks Huyen & Well done!